Foulsham, London’s great filth repository, is bursting at the seams. The walls that keep the muck in are buckling, rubbish is spilling over the top, back into the city that it came from. In the Iremonger family offices, Grandfather Umbitt Iremonger broods: in his misery and fury at the people of London, he has found a way of making everyday objects assume human shape, and the real people into objects. Abandoned in the depths of the Heaps, Lucy Pennant has been rescued by a terrifying creature, Binadit Iremonger, more animal than human. She is desperate and determined to find Clod. But unbeknownst to her, Clod has become a golden sovereign and ‘lost’. He is being passed as currency from hand to hand all around Foulsham, and yet everywhere people are searching for him, desperate to get hold of this dangerous Iremonger, who, it is believed, has the power to bring the mighty Umbitt down. I read and reviewed Heap House last week with gusto and promptly proceeded to read the sequel Foulsham. 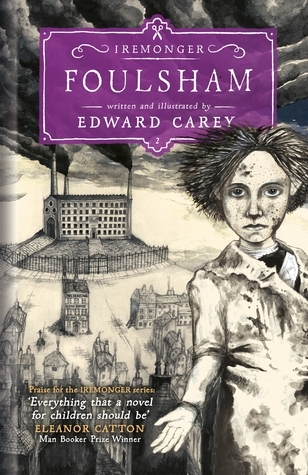 In a nutshell (in case you want to avoid the inevitable spoilers below): Foulsham is as delightful and quirky as Heap House and without suffering too much of Middle Book Syndrome, allows for the overall arc to progress in a measured way i.e. the main mystery is still mysterious but this middle book doesn’t feel like a filler book. Warning: spoilers for Heap House ahead. Clod Iremonger – now a golden sovereign – and Lucy Pennant – now a button – are in dire straits. Clod is being passed around in Foulsham whilst being hunted by his family. Lucy has been abandoned in the Heaps and they can do nothing about it. Until they are both rescued by concerned parties and restored to their human forms. Now, trying to find each other, both Clod and Lucy come across truths about who they are and realise that they need to come forward as heroes. And they must do it, before Lucy falls apart or before Clod is found by his family again. In Foulsham the action moves from the claustrophobic, self-contained Heap House to the outside world. Only, that wider space is no less bound by rules and constrains than Heap House was. Surrounded by walls and under the Iremongers’ iron rule, the inhabitants of Foulsham are trapped by terrible circumstances – this is a story that does not pull punches. Issues of poverty and class (which are extrapolated from historical realities) have been seamlessly interwoven with the supernatural and placed in the context of the Irermongers’ family history. It is interesting to me that even though they are the obvious villains of this story, there is just enough underlying questions still unanswered that could, potentially, point toward them actually having being victims themselves. Because the truth is: both the Iremongers and the Foulsham folks have been effectively walled outside, separated from London. The question of identity which I singled out in my review of Heap House is still, to me, the driving force of these novels. With objects going about repeating their names, with people forgetting who they are, the story is still very much concerned with personifying objects and objectifying people. The vividness of certain descriptions of the deeply felt connections between people and objects (who might have been people before) is just another part of the narrative that really stands out. In here though, more even than in the previous book, I fell in love with Clod and Lucy as they become more and more real. I love the recurrent thread of heroism, of fighting for what is right that runs through their story and I love how they are apart – experiencing those things independently – for most of the book. Another striking thing about the Iremonger series is how that voice, that narrative colourfulness lends itself to well to a very visual book. It goes beyond its awesome illustrations: I can very easily imagine these books as animated stories, preferably narrated in the same style of Pushing Daisies or Jane the Virgin. I really can’t wait for the final book. They told me I was the only child in the whole great building,but I wasn’t. I knew I wasn’t. I heard them sometimes, the other children. I heard them calling out somewhere down below. I lived in a mean room with my governess. Ada Cruickshanks was her name. ‘Miss Cruickshanks’ I had to call her. She gave me physic very often from a tablespoon, it had a strange enough smell to it, but it felt very warming inside, as if it took away winter. I was given sweet things to eat, I had pound cake and tea cake, I had Forlichingham Pie too, which, in truth, was not my absolute favourite, the top of it being somewhat burnt according to tradition and the insides rather a swill bucket of left-overs all covered over in sweet black treacle to disguise the taste. Miss Cruickshanks said that I must eat it all up, she would be cross with me if I didn’t. So then I ate it. She would tell me odd stories, Miss Cruickshanks would, not from a book, but from her head, she should sit by me and looking sternly she should begin, ‘Now listen, child, this is the truth of it.